Teddy bears are hugely collectable with both young and old collectors. While famous brands such as Steiff are well known, perhaps less well known are Burra Bears, which hail from the small island of Burra, just off the west coast of the Shetland Mainland. 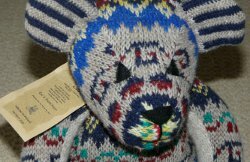 Made only from soft Shetland wool, knitted into traditional Fair Isle patterns, Burra Bears were originally made from old jumpers. Nowadays, there are not enough old jumpers to satisfy demand, so Burra Bear founder Wendy Inkster is forced to use new wool, instead - but she still makes sure it is local wool, locally knitted. We discovered the bears whilst on holiday in the Shetland Islands and fell in love with them immediately. So much so, in fact, that we came home with one! 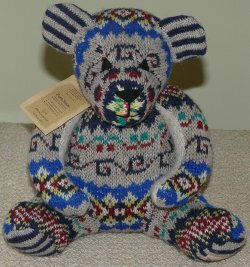 Each teddy bear is given a traditional Shetland name, so no two bears end up the same! Many Burra Bears end up travelling a long way from their Shetland home, so to make sure that they stay comfortable while on the road, each Original and Peerie bear comes in its own Hessian bag with a window for it to see out of whilst travelling! Inside the bags you�ll also find a postcard, so that they can write back to Wendy to tell her where they have ended up. Christmas time is approaching, and I�m sure you will have all seen the Christmas lights being prepared in town centres across the country. Just in time for Christmas, we�ve recently added quite a few new pieces of stock to our website, I�ve included a few pictures of some pieces below - remember it�s easy to view all our current stock by clicking on the VIEW ALL STOCK link in the top menu bar. Troika Slab - Marilyn Pascoe, Troika Cube - Anne Lewis, Pendelfin Rabbit Christmas Scene, Poole Pottery Delphis Dish - Carol Cutler & Troika Wheel Lamp Base.